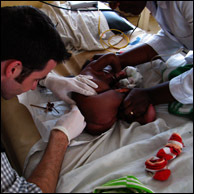 With the help of a $750 grant from the Benjamin Josephson Fund, I spent four weeks as the supervising pediatrician at Mbingo Baptist Hospital, Cameroon. Mbingo Baptist Hospital is a small (180 bed) community hospital facility in a rural setting in a high altitude English-speaking area of north-west Cameroon. The hospital has 20 dedicated medical pediatric beds and a small number of addition cots for newborns in the adjoined maternity facility. During my time at Mbingo, I oversaw day-to-day goings on the pediatric service and was able to broaden my experience with a wide range of clinical cases. The majority of the caseload comprised children with dehydration and infectious diseases, including complications from tuberculosis, HIV and AIDS. Among other entities, I also saw patients with rabies infection (something I had never seen before and am unlikely to see again), advanced malignancies (Wilm�s tumor, intracranial tumors, Burkitt�s lymphoma) several patients with typhoid infection, and multiple patients with malaria and its compliations. Having had some experience in clinical Neurology in adults and children, I also saw a number of patients with neurologic problems both in the in-patient and out-patient settings. Resources at the hospital were in many respects scarse, with no access to ICU monitoring or invasive ventilatory support, no CT or MRI imaging, no EEG, only one X-ray machine, and one ultrasound/echocardiography machine. There was no histopathology lab at the hospital and microbiological studies were also fraught with difficulty, with no body fluid cultures available. In some respects, this was a very enlightening experience, since we were forced to be much more cognizant of the clinical aspects of the cases in order to reach a diagnosis. I also put in place the foundations for a research project on mitochondrial toxicity among neonates on AZT, an anti-retroviral drug used to minimize perinatal acquisition of HIV infection. I would like to express my profound gratitude to the Benjamin Josephson Fund for making this trip (and others like it) possible.